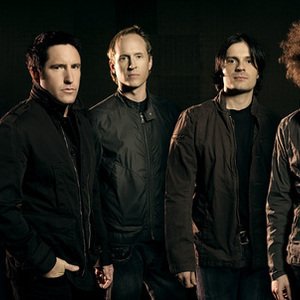 Nine Inch Nails is an American industrial rock band that was formed in Cleveland, Ohio, United States in 1988 by Trent Reznor, the only constant member of the band. He is generally credited for popularizing the genre known as "industrial rock". Born Michael Trent Reznor, he was raised by his maternal grandparents in Mercer, Pennsylvania, USA. Reznor took up piano at the age of five and in high school took up the tuba and saxophone. During the early to mid 80s Trent played with various synthpop and new wave groups such as Exotic Birds and Option 30 before beginning his solo project. Nine Inch Nails has also produced a number of EP's, remixes, and provided contributions to various movie soundtracks, including Lara Croft: Tomb Raider,The Crow, Natural Born Killers, Lost Highway and Tetsuo: The Bullet Man. Trent Reznor provided the (largely ambient) soundtrack for the id Software game Quake. * Trent Reznor has worked with several big names in musical collaboration outside of NIN in recent years, including time rocker artist David Bowie, Maynard James Keenan of Tool, Zach De La Rocha of Rage Against the Machine, Peter Murphy of Bauhaus, Josh Wink, Ice Cube, Dr. Dre, slam poet Saul Williams, hip-hop producer Puff Daddy & The Family, Peter Gabriel, Henry Rollins and more recently, hip-hop producer El-P and Queens of the Stone Age.